Caleb "Achy Dad" Clark: Cervical Ridiculousness. A "back log" about several weeks dealing with Left Cervical Radiculopathy upper back and arm pain and problems. Cervical Ridiculousness. A "back log" about several weeks dealing with Left Cervical Radiculopathy upper back and arm pain and problems. I hope you're not in pain if you're reading this. If you are, I can relate. This is a "back log" for any other achy folks out there who might be surfing and looking for someone elses experience, or might be helping someone who is suffering. Comments welcome! Let me start with a reminder to myself for the rest of my life. Whenever I feel any back issues that cause pain, loss of strength, or numbness in my arms or legs, I need to immediately jump into bed, rest, de-stress, move to light activity, and see a doctor who is a good listener. To keep this from happening, I need to pay very close attention to my work posture, stress management, diet and exercise. Brilliant and original a know, but hard for me to remember in the moment! This post is about dealing with Cervical Radiculopathy, pain and neurological symptoms from condition that irritate a nerve in the cervical spine (neck) over several weeks. "Best Rest" should be called "Bed Healing"
When I'm in pain, I don't want to rest, I want to heal to stop the pain. It took a few weeks of this pain for me to remember from my past back issues that "bed rest" isn't really resting, as much as bed healing. I was going to work too much, driving too much, taking baths with my head tilted too far forward (although Epsom Salt helped a lot), taking slow flat walks outside once a day, which turns out not to be as good for cervical backs, as for lower backs. Generally not really piecing together that my back was causing my arm to hurt. And that meant nerve pinching, and that meant I really needed to get the weight of my head off the spine and loosen the muscles behind my neck that were compressing my spine from stiffness and holding stress in. That means bed rest at 45 degrees, neck supported, or lying all the way down, or on my side in fetal position. Bed rest is so hard at anytime, but with a job, young family, etc. Even harder. 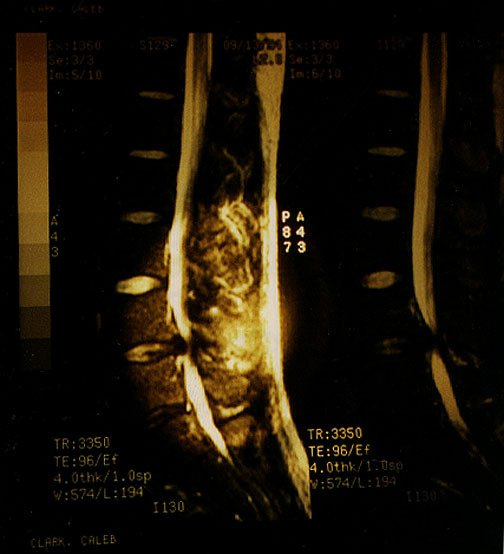 1995 MRI. Black disc protrusion hits bright nerve cord. In 1995 I had back surgery on a herniated (bulging) disc in my low back, the classic L4-L5 disc. I had a discectomy, wherein they hollow out the disk and let the bulge that was pinching nerves in my left leg and back, drop back in and fill the disk area with scare tissue. Those disc issues were caused by a injury years before, and like this upper back issue, brought to the forefront by mismanaged stress, bad posture, poor health and being out of shape. In that case, I was in the worst break-up of my life, smoking, and working on the computer too much. Stress. I hold it in my back, and I sit a lot while I do. This time I had work and family stress. At work Fall approached, when we have to get our enrollment numbers, and a personality conflict happened with two folks I work closely with, and needed to get things done with. Horrible workplace overflow of anger, hate and bad communication (fixed now). I started sniffing around for backup work, which is stressful too. And at home, a baby and toddler. And I had a side contract, and work starting at a local public school. I've been tilting my head forward, and backward, a lot. Some because I'm still adjusting to having to wear reading glasses! Sometimes to read to my toddler in his bed. Sometimes to look down at my laptop in meetings away from my monitor. I stopped exercising at the gym where I was at least walking to work 3 days week and doing light strength training. Medical Log To Stabilized Moderate Pain, Pre-MRI. 08-03-04-15ish. I woke up after falling asleep in my toddler's bed reading to him. I couldn't straight my neck for days. Started popping Ibuprofen and Acetaminophen, alternating since they don't conflict much. Mostly my back hurt under my left shoulder blade and left spine around C4-C7. Felt like I tore something. 08-07-2015. Doctor visit. He's still rushed, tired, but okay. I wish he's slow down though and connect with me and educate/advise me more. Diagnosis. Cervical anterior longitudinal ligament sprain. Thoracic back sprain. Neck sprain in other words. I was prescribed Diacnoflac (daytime painkiller), and Valium and Tylenol 3 Codine for night time. Worked, but it really hurt for days. Went to work some, rested some for a few days. Put off a long drive. Then took the drive for work and the pain started to really hit my elbow joint and forearm. Bad. Make it home, in bed. Hot baths with 2 of Epsom salt really help for a bit. 08-22-15. Family leaves in pre-planned week long trip to grandma's farm. Probaaly better for my wife not to have two kids to take care of and a baby all alone! I had friends, and neighbors. I make the guest room into my hospital room. Bitter sweet to think of the week ahead. Good for resting, books, movies. But I wanted to go sailing and hiking too and out with friends. Not that any of our friends go out much anymore with all the kids sprouting up. I take a long slow walk in the woods a couple of times on a flat path, slowly. Seems to help my mind at least and my back is temporarily better, but then bad. I work in bed on a laptop with a wedge pillow, neck fully supported, reading glasses tiled way down to keep my neck on the pillow, laptop on pillow on lap. 08-23-15. I carefully go shopping. Driving a stick and steering is a bit hard, but otherwise I just take it slow. I remember thinking that this is what it will surely feel like to be very old and shopping! I stock up on my favorite healthy foods for mending: Wild caught Salmon (for protein and fish oil), spinach, blueberries, bananas, yogurt, fresh unfiltered cider. I make a killer movie list and stop at a book store for "World War Z" (great read!). 8-25-15. Worse arm pain. Strange days of movies on the laptop sleeping sideways, Prednisone hot flashes, but the arm pain was still not as bad as before. My mood was suffering though. Go to doctor. Diagnosis: Cervical Radiculopathy. Taken off pain killers. Given Prednisone 10mg staged 12 days in lower and lower doses. The first two days at the higest dose the pain almost entirely left my arm and forearm. Like magic. Pain is only in my back at the source. Still can't lift head, back, and if do and turn it, then the pain shoots down my arm. Then the pain comes back, slowly each day, but still better. Xray ordered. I call one of my best friends, now a doctor. He helps me a lot by listening and supports my doctor's moves, but not his impatience. Mom and dad are worried. Family calls every night. Lots of time dazed out and watching movies in bed on my side, with laptop at 90angle on bed, so it's parallel to my eyes. 08-25-15. Get Xray. 2-day turnaround, but I didn't get an appointment for two weeks. I'm feeling really pissed at my doctor. I call and get an appointment the next day. I write a passionate note with my questions. I manage to do some work, and it doesn't make it worse. I changed my computer sitting position completely and am in a much better posture, not looking down at laptop screen and then up at main screen, all one screen. 8-26-15: Xray results. Degenerative disk disease, C-4-C6. Cervical Radiculopathy. MRI time next week. I push my doctor to listen to the note I wrote, about being really hurt, scared and down and needing more care. He softens up a bit. Really though, I think he needs care too. He's harried, burnt, or his bedside manner is impatient. I think I'd heal better if he connected more with me, listened to my questions, talked to me about what I'm up against. I think most folks would. 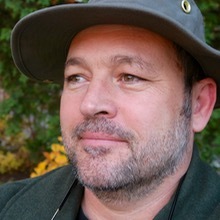 Part of my job is to help professors use their computers and the Net to support their teaching. I know how hard patience is to keep! I often just want to tell them to do what I know they will end up doing and not have to explain, listen, help them get to their own action point. But still, it's the best way, to work because when they are empowered and educated and that is calming and motivating. Prednisone seems to hit me a 3-4 hours after taking it. And it gives me a hot flash and then helps the pain it seems. Given that, I'm taking it with my yogurt, banana, vitamins, 16oz of water breakfast. And then again at dinner so it helps with sleeping. 08-27-15. My mother brings in the big guns, a family friend who is a retired neurosurgeon, and a pretty famous one. He actually calls me at night. He listens well to my backstory and then asks simple questions like, "does it feel better if you lift your arm over your head?" (Yes). "Does your thumb hurt?" (No, forefinger sometimes). Then he says Cervical Radiculopathy, probably C5-C6, get an MRI. Send him the disk FedEx. And, "Think of this like a pebble in your shoe. You have to stop grinding the pepple on the skin. So, with this, you have to get the weight of your head off your spine, relax, bedrest, supported neck, and there's an 80% chance you won't need surgery." That really helped me relax. 8-28-15. Stabilized at home alone. 6-8 Tylenol only. Everything in back and left arm hurts, but it’s moderate, not severe. 08-30-15. Family inbound tonight. Still stabilized, still pain all in that area. It's a big problem though, I can feel it. I have hope, and feel pretty good that I won't need surgery. I gave one of my contracts to my friend and told my boss I'm on light duty. 08-30-15. Slightly better every day. At least days I really rest between light activity. I actually started some very light range of motion movements and stretching - avoiding all pain points though. MRI this week. Got some more Tylenol 3 and Valium to help with bouts of severe pain and sleeping. Armpit, and arm to hand still are painful, and hurting when rolling over in bed, in morning, and if too active. Going into to work every day for a hour or two, but then lying down. Then up to help with the kids, then lying down. Family return was very strange. Arrival 9pm two days ago. Shaw just awoke after sleeping on drive. I limped to kitchen and Laura was back to me wearing new clothes and with bushy hair. Shaw had on a new hat and was back to me. I honestly didn't really think they were my family! But they were. Since they've been back we've been in a bit of a emergency configuration of care. I focus on resting and keeping my job. Laura focuses on her health and the kids, activities, home, finances, etc. We check in often, but are free to focus on these priorities. Working more in bed on a laptop with a wedge pillow, neck fully supported, reading glasses tiled way down to keep my neck on the pillow, laptop high on foam pillow on lap so hands aren't tiled back and my head is really resting on the pillows. 09-03-15. It's been hard with the family. Laura is with baby, so she's really not in nurse mode for me. And she's not a natural nurse anyway. I feel her love though, and don't doubt it for a moment, but sickness and hurt pushes everyone's buttons. She had a sick father for a long time who wasn't able to be present a lot when she was a kid. Shaw is amazing, comes in every morning and says "how's your back" and the today say "babies are a lot of work! I sometimes help with Ivy, but I mostly now help with poppa's back." I am easily lulled into the comfort of resting in bed, reading, etc. When sometimes gently helping around the house more would be good for my body and the family. It's easy to slip into a relaxing drug induced rest. Laura and I talked it through, we marveled at how we're not getting enough help from friends when we need it and we're making more calls. We reconnected and cuddled. I'm mostly moderately in pain. When I cough, it hurts like hell in my armpit, deep in my shoulder, and arm. I easily tire and my arm kills if I move around to much quickly. I can't move too quick, so a calm walk is good, but not around traffic with kids if I'm looking around for cars etc. MRI tomorrow. As an older achy dad, posture and exercise will be so vital to getting through this and staying strong after. JASON DAVID EUBANKS, MD, Case Western Reserve University School of Medicine, Cleveland, OhioAm Fam Physician. 2010 Jan 1;81(1):33-40.